Summary: Be healthy and go green with EcoCanteen! EcoCanteen are stainless steel water bottles. Be healthy and go green with EcoCanteen! 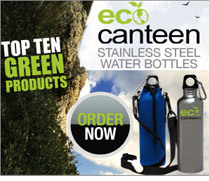 EcoCanteen are stainless steel water bottles. It has a sport top with carabiner clip which makes it easy to take anywhere! Simply clip to your bookbag, purse, gym bag or stroller. It has a wide-mouth lid. This means no handwashing, no brushes. It cleans thoroughly in dishwasher. Plus it can easily take in ice cubes and other beverages. It's made out of food grade stainless steel. Non-leeching, non porous surface. IT's long been the material of choice for the food service industry. Save Money: Give up bottled water and add thousands to your retirement. Bottled water is oil intensive. Save the Enviroment: Plastic water bottles are consuming our landfills, plus recycling plastic is an energy consuming process. Protect Your Health: Plastic bottles are made with harmful chemicals that can get into your water. Studies show these chemicals are hazardous.